How remarkable in this era of director-infected operatic “concepts,” that neither Shakespeare’s heart-crushing play nor Gounod’s transcendent music is sacrificed in the focused, taut, animated work by celebrated Broadway director Bartlett Sher. And the director has a musically astute, stylistically aware collaborator in conductor Emmanuel Villaume. 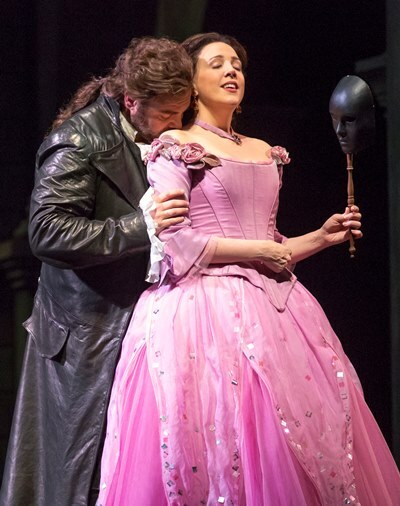 This is also a beautifully sung “Romeo” featuring a cast of smart singers who create credible, sympathetic characters – starting with the star-crossed lovers themselves in tenor Joseph Calleja’s impulsive, bedazzled Romeo and soprano Susanna Phillips’ rapturous Juliet. Even as you’re swept away by the vocal splendors of both, you’re also disarmed by the young dreamers they portray. 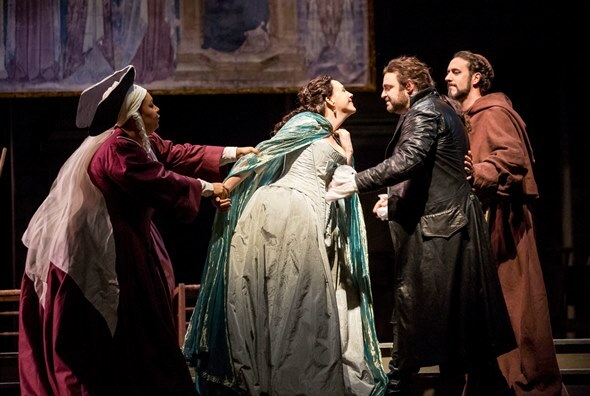 To contain Shakespeare’s play within an operatic frame of reasonable scope, librettists Jules Barbier and Michel Carré did some serious slicing and bridging, but the arc of the play remains intact and so do the great scenes of recognition, reflection and transition. The touchstone, of course, is the lovers’ discovery of each other, to which Calleja and Phillips bring irresistible freshness and all the untrammeled certainty of love at first sight. Their singing together possesses both brilliance and innocence, an open-hearted quality that informs and certifies the truth of a love that quite dispenses with an old family feud that now means nothing to either of them. The bloom of first love is on both voices as tenor and soprano illuminate the darkened “balcony” scene, which in this production is played out on the ground level of a unit set. The same space serves variously as dance floor, an open plaza and even – overspread with a vast white sheet – the secretly bound couple’s marriage bed. In Gounod’s opera as in Shakespeare, one of the most charming vignettes comes at the end of the newlyweds’ nuit d’amour as they agonize over whether the warbling songbird is the lark signaling daybreak and the need for banished Romeo to flee for his life, or the nightingale bidding them remain in each other’s arms. 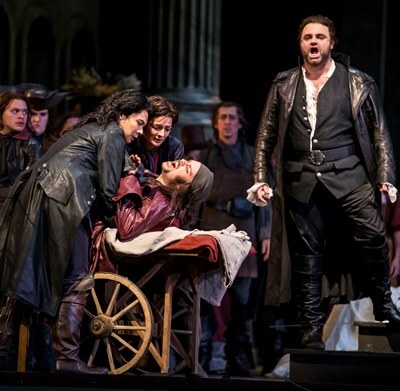 Calleja and Phillips captured that tender conflict with vital singing and physically ardent acting to match. The twosome closed out this marvelous collaboration with a tomb scene — which Gound and his librettists distilled to its tragic essentials — that found young lovers grown to mature estate, their devotion as sure and perpetual as any hope of life together is hopeless here below. There is simple clarity in Sher’s direction of the scene, and it was sung with serene passion. It’s a visually imposing prospect, this grand set from the Metropolitan Opera, and Sher adapts it to his every purpose with equal parts of imagination and élan. On this urban plain, the fateful confrontation plays out among Romeo, his pal Mercutio and Juliet’s cousin Tybalt. In terms of intensity and dramatic credibility, what Sherr and fight director B.H. Barry have wrought here is exceptional. Tybalt (Jason Slayden) first harasses the adolescent and completely overmatched Montague clansman Stephano (Marianne Crebassa in the trouser role, making a lovely moment of the ballad that draws Tybalt’s taunt). Mercutio (Joshua Hopkins), whose fiery temperament mirrors Tybalt’s, basically tells Tybalt to pick on someone his own size – namely Mercutio, who is probably the more skilled swordsman. Along comes Romeo, newly and secretly married to Juliet, who elicits Tybalt’s scorn but, for a reason he cannot reveal, will not answer the Capulet’s challenge. The scene is famous, but also pivotal, the central dramatic game-changer. The trick in the opera is to fit the rapid escalation of events into the allotted measures of music without rushing and thereby sacrificing the genuine edge of tension. What happened onstage on opening night looked more like the music had been written to accompany the action rather than the action fitted to the music. It was perfectly paced, with Tybalt incredulous at Romeo’s refusal to fight him and Mercutio finally leaping in to save Romeo’s honor and to have this fight with Tybalt he’d long wished for anyway. The actual sword fighting was as convincing as any I’ve ever seen on a stage. And, by the way, Slayden and Hopkins also sang very well. 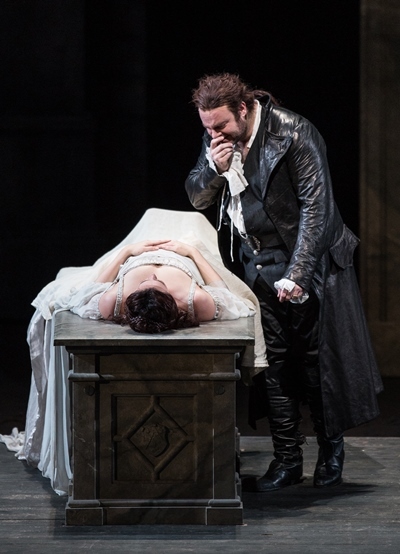 Fine vocal displays in supporting roles were evident on every hand, notably bass-baritone Philip Horst as Lord Capulet, mezzo-soprano Deborah Nansteel as Juliet’s nurse and bass-baritone Christian Van Horn as Friar Laurence. 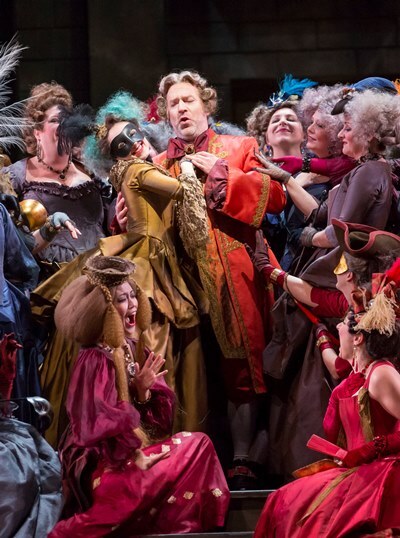 The Lyric Opera Chorus, looking fabulous in Catherine Zuber’s costumes, scored the night’s first big success with Gounod’s choral preamble to the tragedy about to unfold. And the Lyric Opera Orchestra answered Villaume’s knowing, poetically attuned leadership with a performance that never flagged in its polish or warmth. Note: Calleja continues in the role of Romeo through March 8, with Eric Cutler taking over the remaining performances March 11-19.